2018 Illinois Miss Amazing Junior Teen Queen Izzy Gonzalez encourages others to share their talents and creativity. 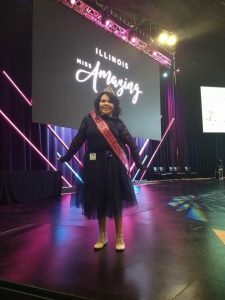 Fifteen-year-old Izzy Gonzalez didn’t know what to expect when she decided to take part in her first Illinois Miss Amazing event in 2017. Miss Amazing is a nationwide program that provides opportunities for girls and women with disabilities to share their abilities and ambitions. Izzy attended the two-day Illinois event in Naperville that includes an interview, evening wear presentation and on-stage introduction. She immediately fell in love with the experience and returned in 2018 to be crowned the Illinois Miss Amazing Junior Teen Queen. Izzy Gonzalez was named the 2018 Illinois Miss Amazing Junior Teen Queen. Now, Izzy is ready to pass on her crown. She encourages other girls and young women with disabilities to consider Miss Amazing and other venues to share their talents and creativity with the world. “It’s an amazing experience and if you’re kind of shy, it really helps you bring yourself out of your shell,” Izzy said. 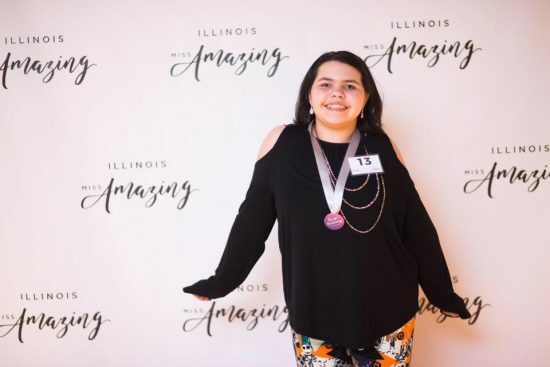 Illinois Miss Amazing is currently accepting registrations for participants and volunteers for its 2019 event on April 5-6 at the Yellow Box in Naperville. The deadline to register is Feb. 15. More information and the registration link is available on the Illinois Miss Amazing website. Miss Amazing is for girls and women ages 5 and older who have an IEP, IPP, 504 plan, SSI or a physician’s records proving disability. The program aims to build self-confidence and life skills for participants as well as nurture a sisterhood of girls and women from different walks of life. The only cost to participate is five cans of food to be donated to the local community. “It’s a fun way for them to shine,” Izzy’s mom, Susan, said. Izzy was born with VACTERAL association, which is a group of birth defects that occurs together and affects many body systems. Izzy’s main issues are severe scoliosis as well as other orthopedic, urological, gastroenterological, neurological and respiratory issues. She’s been a participant with the University of Illinois at Chicago’s Division of Specialized Care for Children (DSCC) since 2005. Susan said Miss Amazing and other programs for youth with disabilities have helped her pinpoint her passion and become more confident. Izzy says she first caught the theater bug through the Champaign-Urbana Theatre Company’s Penguin Project. The Penguin Project is a national program that provides a supportive environment for children with disabilities to explore their creative talents in a community theater experience. Youth with disabilities are the artists and are joined on stage by “peer mentors” without disabilities. 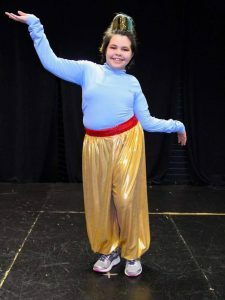 Izzy Gonzalez played the role of the Genie during the Penguin Project’s production of Aladdin, Jr.
Izzy joined the Penguin Project in 2016 and has done three musicals so far. “From the end of the first show, I knew I just wanted to do this (acting),” Izzy said. Izzy then learned about the Illinois Miss Amazing Program from one her fellow Penguin Project artists. Miss Amazing participants are asked to do a one-on-one interview, presentation in evening wear and a personal introduction. Izzy said the event also includes an optional talent showcase and a dance party on stage. “They don’t judge you on this, it’s just for fun,” Izzy said, noting she chose to sing. During her second Miss Amazing event, Izzy said she was shocked to be named junior queen. “I was like, ‘Did they really just call my name,'” she said. Susan said there were no words for seeing Izzy crowned on stage. “My heart was so full,” she said. Izzy says she’s looking forward to another fun Illinois Miss Amazing weekend and continuing to pursue her acting, singing and passion for theater. She recently became involved with the Pens to Lens screenwriting competition. The Champaign Urbana Film Society runs the competition for east-central Illinois K-12 students, who submit their written scripts for local filmmakers to produce as short films.